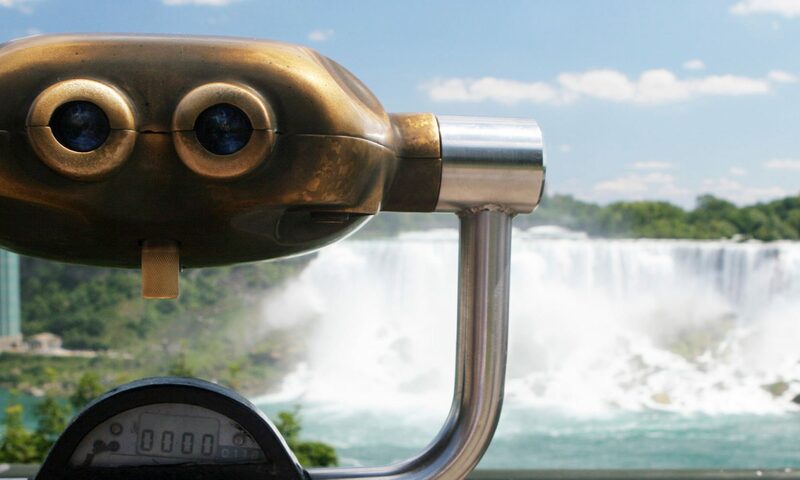 Home » Niagara Falls History » Niagara Falls Tourism History » Daredevils of Niagara Falls » William “Red” Hill Sr.
On May 30th 1930, an estimated crowd of 25,000 lined both sides of the Niagara River from the Horseshoe Falls to Queenston – Lewiston. They were present to witness a spectacular feat performed by legendary river man William “Red” Hill Sr., a native of Niagara Falls, Ontario. At the age of 42 years, Hill Sr. was going to fulfill his promise to challenge the Great Gorge Rapids and the Whirlpool from the docks of the Maid of the Mist for a second time. The first journey by William Red Hill Senior was done in 1910. He used the barrel constructed by Bobby Leach after he saved him from a near death experience. Hill Sr.’s second barrel was of steel construction, similar to George Strathakis. It measured 182 cm long with a diameter of 91 centimetres. Its interior was only 152 cm long because Hill Sr. had built in 15 cm thick bulkheads at both ends. This barrel had a 36 by 46 cm manhole to allow entry. This entry was covered by a sliding steel cover sealed with rubber gaskets. There were air holes on the sides of the barrel, which were plugged with cork to allow them to be opened in an emergency. The interior of barrel was equipped with a harness system so that Hill Sr. would lay suspended away from the walls. The barrel weighed 620 pounds and was painted bright red with gold lettering with “William Red Hill, Master Hero of Niagara” inscribed on the sides. At 1:15 p.m. May 30th 1930, Hill Sr. climbed into the barrel and set off on his second journey. The current was so strong that it delayed Hill Sr. one hour and forty minutes before the river released his barrel. His trip through the rapids to the whirlpool took ninety seconds. Upon reaching the whirlpool, the barrel became stuck in the vortex. It took three and a half hours before Hill Sr. and his friends were able to free the barrel so he could resume his trip to Queenston – Lewiston. Hill Sr. arrived at the Queenston docks 5 hours after his departure. He suffered only a few minor bruises. Red Hill Sr. made his third trip through the same rapids on Memorial Day 1931, using the barrel of George Strathakis. Hill Sr. survived this trip as well but the barrel had sprung a leak and was half full by the time it reached the Whirlpool. For the second straight time, the barrel became caught in the vortex. Only through the heroic efforts of his son William “Red” Hill Jr., who swam out with a rope attached to his waist, did Hill Sr. survive. The next day Hill Sr. went back to the whirlpool and continued his journey in the barrel to Queenston. Red Hill Sr. had officially been credited with saving the lives of twenty-eight persons from drowning. He has received more lifesaving awards from the Canadian Government than any man in history, with his first coming at the age of 9 years old. During his lifetime, Red Hill Sr. recovered the bodies of 177 bodies who had died from accidents or suicides. In February 1912, a spectacular tragedy known as the “The Ice Bridge Disaster” turned the spotlight on Hill Sr. in a large way. On August 8th 1918, Hill Sr. was also part of the event “The Tug and the Scow”.